Listed below are companies ranking first in various key categories and regions from EnergyPoint Research’s latest Customer Satisfaction Surveys. The EnergyPoint Research Seal of Excellence™ is available to those companies receiving the highest rating in a specific survey category. 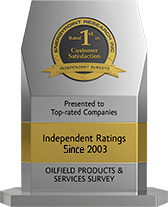 Backed by EnergyPoint's acknowledged objectivity and expertise, the seal is a recognized symbol of excellence in the oil and gas industry. Download PDF brochure. The EnergyPoint Research Customer Satisfaction Award™ is an extension to the Seal of Excellence Program available to those companies receiving a first‑place rating in one of our survey categories. It is a physical tribute and testament to high‑performance companies delivering outstanding customer satisfaction. Download PDF brochure. To view lists of top-rated companies by segment, click below.